BC Baseball has established itself as one of the top junior college baseball programs in the region and in the country. In 2017, Bellevue had the top RPI in the NWAC for the entire regular season. The squad was also ranked in the top five in the NWAC Under Armour Coaches’ Poll for the entire season. Bellevue also was near the top with a 36-16 record; good for third overall in the NWAC for winning percentage. In 2016, Bellevue was the top ranked team in the NWAC for all but one week during the regular season. In the last eleven years, Bellevue has won the NWAC title three years, finished runner-up once, and finished third twice. The squad was ranked nationally all season long in 2012 and was No. 8 nationally in June 2011 after capping off an amazing year by winning the NWAC Championship with a 37-14 record. It was the team’s third title in five years (2007, 2009, 2011) after a long drought dating back to 1979. In 2007 the team was ranked No. 1 in the NWAC Top 8 Coaches’ Poll for most of the season. The squad also finished with a national ranking of 18th; putting Bellevue within the same group of other national powerhouses. A strong reputation precedes the BC baseball program. With several league titles to its name, a high number of winning teams, and top-notch facilities, it’s no surprise that BC baseball athletes consistently receive scholarships to 4-year colleges and universities. BC Baseball has one of the top graduation rates in all of northwest community college athletics. 90-100% annually. 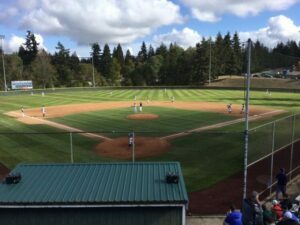 Since it’s early beginnings in 1970, BC Baseball has captured five NWAC titles (1973, 1979, 2007, 2009, 2011) and 20 region titles. In 1999, Bellevue had more players selected in the professional baseball draft than any other two-year college in the nation. BC has also sent an average of nine players each year onto the four-year level for higher academic and athletic opportunities. BC takes pride in offering top-notch facilities such as Courter Field, one of the best playing fields in the region. These accomplishments set BC Baseball apart from other colleges and offers a positive, rewarding experience and many opportunities for building athletic talent.